Messier 64 (M64), also known as the Black Eye Galaxy, Evil Eye Galaxy, or Sleeping Beauty Galaxy, is a famous spiral galaxy located in the constellation Coma Berenices. Messier 64 has an apparent magnitude of 9.36 and lies at a distance of 24 million light years from Earth. The galaxy has the designation NGC 4826 in the New General Catalogue. The Black Eye Galaxy occupies an area of 10.71 x 5.128 arc minutes, corresponding to a linear diameter of 70,000 light years. It is a popular object among amateur astronomers because its bright core is visible even in small telescopes. Binoculars reveal only a faint, irregular patch of light, but 4-inch telescopes easily show the galaxy’s large, bright nucleus and if observing conditions are particularly good, its large dark dust lane. The dust lane is even easier to see in 6-inch telescopes, while 8-inch instruments also reveal the galaxy’s outer regions, which appear as a large halo of wispy nebulosity. The Black Eye Galaxy is not particularly easy to find. 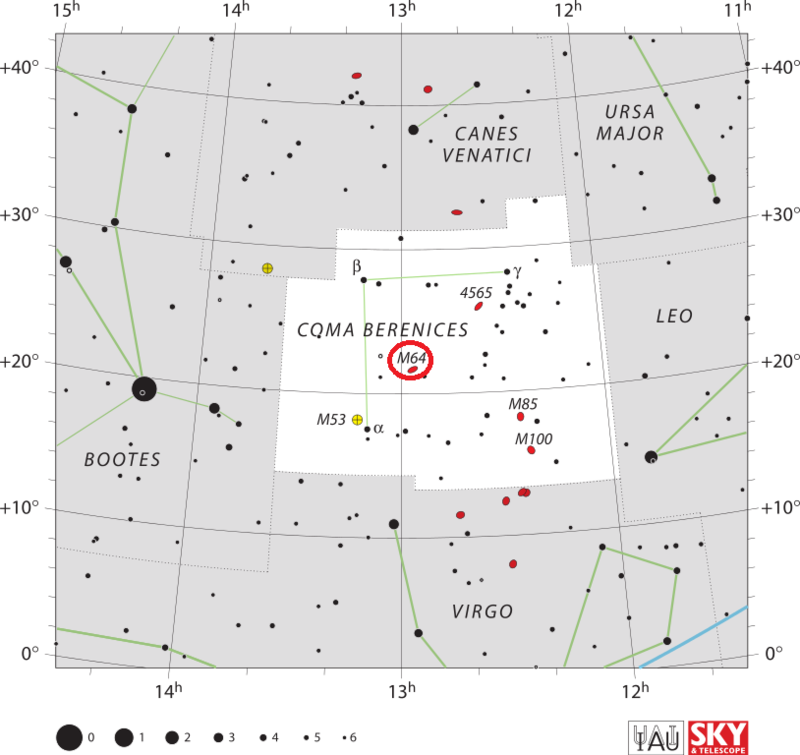 It is located about a degree to the northeast of the star 35 Comae Berenices, which lies 4 to 5 degrees to the north-northeast of Diadem, Alpha Comae Berenices, a binary star with a visual magnitude that varies from 4.29 to 4.35. The globular cluster Messier 53 can be found only 1 degree to the northeast of Diadem. Both the cluster and the star lie about 15 degrees to the west of Arcturus, the fourth brightest star in the night sky. M64 lies 19 degrees west and a little north of Arcturus. The best time of year to observe M64 from northern latitudes is during the spring. This image of Messier 64 (M64) was taken with Hubble’s Wide Field Planetary Camera 2 (WFPC2). The color image is a composite prepared by the Hubble Heritage Team from pictures taken through four different color filters. M64 has a spectacular dark band of absorbing dust in front of the galaxy’s bright nucleus, giving rise to its nicknames of the Black Eye or Evil Eye galaxy. At first glance, M64 appears to be a fairly normal pinwheel-shaped spiral galaxy. As in the majority of galaxies, all of the stars in M64 are rotating in the same direction, clockwise as seen in the Hubble image. However, detailed studies in the 1990’s led to the remarkable discovery that the interstellar gas in the outer regions of M64 rotates in the opposite direction from the gas and stars in the inner regions. Active formation of new stars is occurring in the shear region where the oppositely rotating gases collide, are compressed, and contract. Particularly noticeable in the image are hot, blue young stars that have just formed, along with pink clouds of glowing hydrogen gas that fluoresce when exposed to ultraviolet light from newly formed stars. 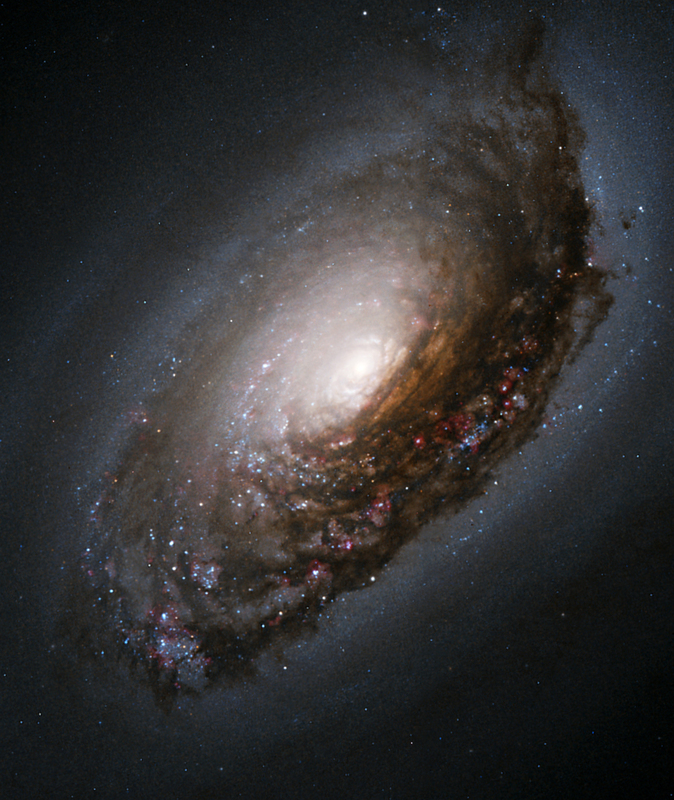 Messier 64 is known for the spectacular large dark band of dust in front of its bright central region, which has earned the galaxy the nicknames the Black Eye or Evil Eye. The dust band has also helped astronomers estimate which side of M64 is nearer to us. It appears to be the galaxy’s southern side. Messier 64 is a member of the Canes Venatici I Group, also known as the M94 Group or the Canes Venatici Cloud, a small, loose group of galaxies within the Virgo Supercluster, located in the constellations Coma Berenices and Canes Venatici. The group was named after the bright spiral galaxy Messier 94, also known as the Cat’s Eye Galaxy or Croc’s Eye Galaxy, located in Canes Venatici constellation. The Black Eye Galaxy is home to about 100 billion stars. It is receding from us at 408 km/s. No supernovae have been detected in it so far. M64 does not contain any known Cepheid variables, which is very unusual for a galaxy this close to us and means that its distance is merely estimated at 24 million light years, but far from certain. 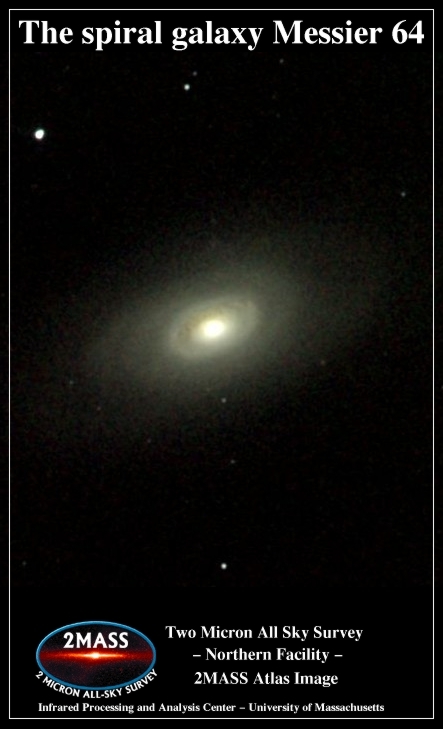 Messier 64 has two counter-rotating disks roughly equal in mass, possibly as a result of a merger with a smaller satellite galaxy in a retrograde orbit or of ongoing accretion of gas clouds from the interstellar neighbourhood. The dark dust lane that blocks the light of the galaxy’s central region may in fact be material from the smaller galaxy that hasn’t settled into the larger galaxy’s orbital plane yet. The inner disk of M64, roughly 3,000 light years in radius, rubs along the outer disk, which spans about 40,000 light years and rotates in the opposite direction at about 300 km/s. 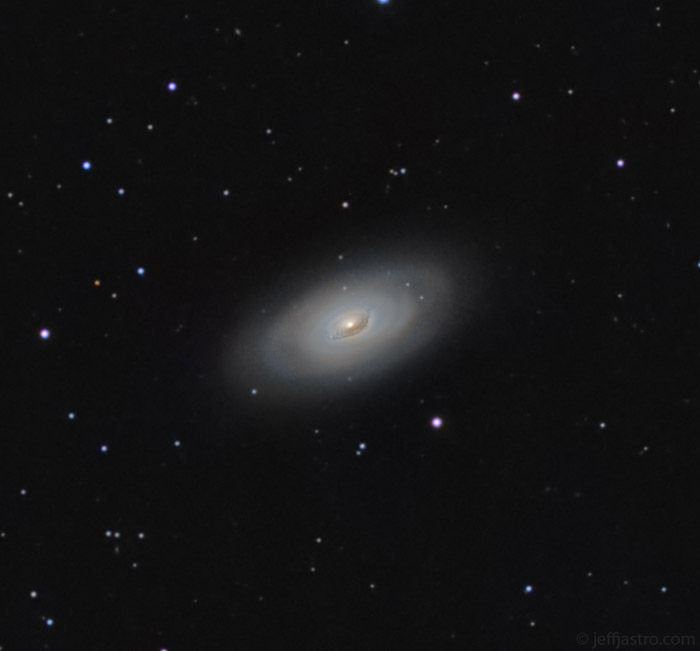 Messier 64. Atlas Image mosaic obtained as part of the Two Micron All Sky Survey (2MASS), a joint project of the University of Massachusetts and the Infrared Processing and Analysis Center/California Institute of Technology, funded by the National Aeronautics and Space Administration and the National Science Foundation. The rubbing of the two counter-rotating disks results in an intense burst of star forming activity in the region where the disks’ gases collide and are compressed. While the interstellar gas in the galaxy’s outer regions rotates in the opposite direction from the gas and stars in the inner disk, all the stars in M64 are rotating in the same direction. In his 1988 book Color Atlas of Galaxies, J.D. Wray proposed that the Black Eye Galaxy may be considered a prototype for a class of galaxies known as Evolved Second Wave Activity Galaxies (ESWAG). These are galaxies that are experiencing a second wave of star formation. Their main spiral pattern contains stars of an intermediate age. Star forming activity first evolved outside and continued for as long as there was enough interstellar material in the region. Then it gradually ceased and did not start again until new material started accumulating and flowing back from the evolved stars by stellar wind, supernova explosions and planetary nebulae. Once there was enough new material, the formation of new stars started again. In M64, the second wave of star forming activity seems to have reached the area where the dark dust lane appears. The Black Eye Galaxy is a known radio source, catalogued as PKS 1254+21. … on the 23rd of March, I discovered a nebula in the constellation of Coma Berenices, hitherto, I presume, unnoticed; at least not mentioned in M. de la Lande’s Astronomy, nor in M. Messier’s ample Catalogue of nebulous Stars [of 1771]. I have observed it in an achromatic instrument, three feet long, and deduced its mean R.A. by comparing it to the following stars [..; yielding a] Mean R.A. of the nebula for April 20, 1779, of 191d 28′ 38″. Its light being exceedingly weak, I could not see it in the two-feet telescope of our quadrant, so was obliged to determine its declination likewise by the transit instrument. The determination, however, I believe, may be depended upon to two minutes: hence, the declination north is 22d 53″1/4 [sic]. The diameter of this nebula I judged to be about two minutes of a degree. Bode’s discovery was the first to be published, followed by Messier’s, while Pigott’s discovery of the object was largely ignored until Bryn Jones recovered it in April 2002. A conspicuous nebula, between Berenice’s Hair, and the Virgin‘s left arm; discovered by M. [Messier] in 1780, who, however, only saw it very faintly. Yet it is magnificient both in size and brightness, being elongated in a line np [north preceding, NW] and sf [south following, SE], and blazing to a nucleus. This is the object which Sir Charles Blagden, on being shown it by WH, likened to a black eye, which though odd, is considered not an inapt comparison. This nebula was fixed by differentiating it with Epsilon Virginis, the bright star 11deg south of it; and it lies between Arcturus and Delta Leonis, about 20deg west from the former bright star.